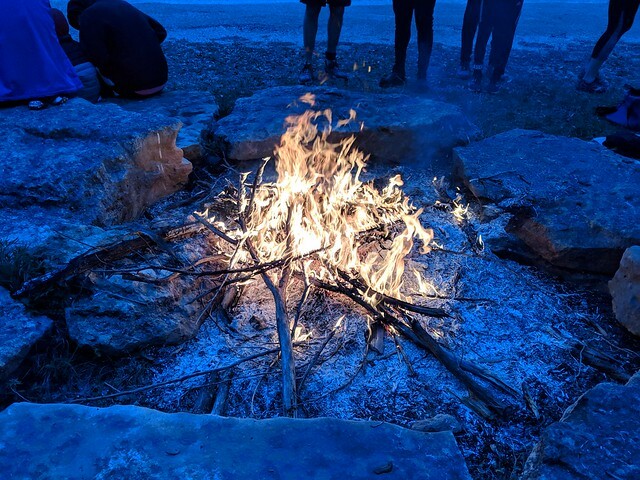 The Tangle 10k race report 2019. Two events in one weekend! Both.. around Johnson City. That's a lot of driving and getting up early. But this was my last chance to get in a supported trail run before SwimRun Georgia, so I wanted to take advantage. Matt was going to join me, but after hauling 100 lbs of bike+gear into the wind, uphill, all Saturday, his body was feeling a little rough. Plus he isn't actually training for anything with a run in it. So I headed out dark and early again Sunday morning by myself. Dark and early and COLD. The front that blew through during our ride was still in full effect, and it was in the mid 40s and windy (north wind), which meant standing around before the run was very chilly. Fortunately they had a fire built up! I didn't remember much about the Tangle course, but they told us it was a little short (6 miles), and it was mostly downhill for 2 miles, down to the water, then mostly uphill all the way back. Yaaaay. It actually ended up being a really fun run. After the first bit where there was walking as people sorted out where they needed to be, and navigated the ups and downs in a tight pack, I fell in behind two girls who were a good pace for me. It's been a while since I pushed a bit while running. Too scared with my hamstring. But this felt good, so I went with it. I mean, I wasn't breaking any speed records, because it was a trail, but I was bombing the rocky downhills as if I'd actually been running trails (I haven't), and attacking a bit on the uphills. Just having fun. Being a kid. The weather was great. I was actually too warm in my long sleeved shirt, once we got into the trees and out of the wind, but I pushed the sleeves up a bit, and it was fine. Eventually I fell back from my rabbits a bit, and spent the rest of the run reeling one of them in and then losing her again. It gave me something to focus on and helped keep me motivated. The course was beautiful and challenging, and I have no idea how I did 3 loops of it last year, undertrained, in much hotter weather. I had figured it warmed up while I was out there, but when I stopped running, it immediately got cold and windy again, and the car said it was still in the mid 40s. What strange weather for the last day of March! Finisher's water bottle instead of shirt. Now I have to decide if I want to do the third race, which is after SwimRun Georgia, when I really have no need to be trail running anymore. But completing the series sounds kinda fun, and I've never run out wherever the 3rd one is. 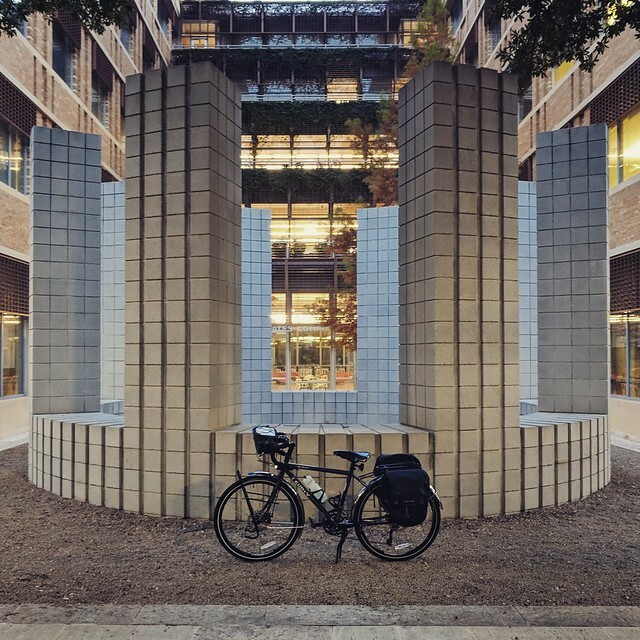 LBJ 100 2019 ride report. I'm happy to report that this ride was VERY DIFFERENT from our ride in 2010. Much less dramatic. Less crying. Yay! 20th Anniversary European Bike Adventure Part 4: The Reservations Have Begun. The good kind of reservations. Not the kind I will inevitably have, wherein I wonder what the HELL I've gotten myself into. The Maze 10k trail run 2019 race report. Been a while since I wrote a race report! Been a while since I did a race. I guess it was IMAZ, huh? Then I took some time off running to try to make my hamstring stop hurting. Then I took time off swimming to make my hamstring stop hurting. And riding my tri bike. But my hamstring still hurt. So finally I went to the doctor, determined via MRI that I had no terrible ailment that I was going to make worse, and started PT for hamstring tendonitis, probably. And that's where I still am. It's pretty okay, as long as I don't sit. But I do a lot of sitting. So I'm doing PT and trying to sit less, and easing back into running and swimming. I have a swimrun in mid-April. Gotta swim and run. So I've been doing 2-3 runs a week, 3-4 miles a run. It's not Ironman training, but it's more than nothing. And since my swimrun will be trail running, I've been trying to get in a couple trail runs. And since it's the beginning of trail running season, why not do a supported trail run? And since Matt has done both my trail runs so far this season with me, why not both of us go out and do the Maze 10k? Oh, the main reason, I suppose, would be those two 4 mile trail runs would be 2/3 of the ONLY runs Matt has done this year. Or.. since March of last year. He's just coming out of a lengthy run hiatus, and jumping up to a 10k moderately hilly trail run is asking a lot. But that's how he rolls. He told me I could go do my own thing and we'd meet up at the end, but my only needs from this run were: get in a supported longer trail run, continue trying to break in my new trail shoes, and do a minimal amount of hamstring-angering. Which means I had no pace goals at all, which meant I was happy to just let Matt set our pace and run through the woods chatting. We were afraid that the weather was going to be super humid and in the 60s, sort of like it was for Karen last year, and were hoping that the polar front that was supposed to move through would hopefully move through during the race. It looked like it would move through later in the day. But as raceday approached, they kept moving the cold earlier and earlier until it never really got warm as they'd predicted, and race morning hit with low 40s and a stiff, cold north wind. Which was miserable as we sat around waiting to run, and pretty much perfect once we got into the woods and started running. We started fairly far back, knowing we'd be going slow, and so we had some walking in the first mile due to congestion. I ended up leading once things broke apart a bit, and quickly moved back behind Matt so he could set our pace. Which maybe he got caught up in the excitement of being at a race again, and went out a little fast. Things went well for the first two or so miles, then Matt's foot started to fall asleep. He was also wearing new shoes, and was very undertrained, and neither of us had done any appreciable hills, up or down. So not really surprising that some part of his body would object. And then he started having compensatory problems in his back because of running strangely because of his foot. Which meant we ended up walking more than he would have liked, but every time he'd apologize, I'd say I had no pace goals, I was just out to have fun in the woods with my best friend. And so we trekked through the woods, we ran through the creek, we chatted about everything and nothing, and said hi to random friends out on the course. In the last 2 miles, Matt's foot finally woke up and his back started feeling better, so we picked up the pace a lot for those miles. We finally hit our stride, and finished up strong and feeling good. Overall it did exactly what I needed it to do. It got me a longer run without having to plan out a route. I got another run in with my new Hoka Speedgoats. I learned I need to do some more shorter runs in my new shoes, because they definitely feel different than my other various Hokas, and put more pull on my plantars. That may be where I end up being the more sore, if I get DOMS from this race. And then when that fades, I'm sure it'll be my hamstring that is the most sore. But mostly my hamstring behaved. It helped that we walked some of the hills, up and down. Much gentler on my hamstring. And I got to hang out in nature with Matt, which is one of my most favorite things to do. Then we came home and napped with the dogs, which is another of my most favorite things to do. 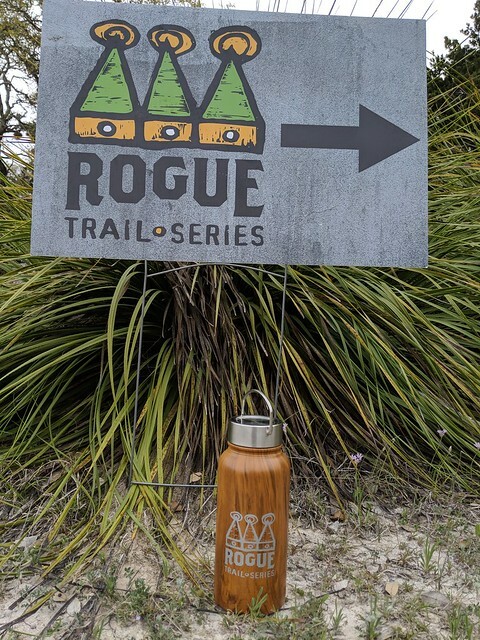 I'm hoping to stay consistent with my running and do the next race in the Rogue trail series in 4 weeks. 20th Anniversary European Bike Adventure Part 4: The Training! We ended up finally settling on and purchasing my touring bike in early July. Between July and late November, I probably rode 1 mile total on said touring bike, split among 4 different rides. Maybe. It may have been less than 1 mile. I admit I was a little nervous once I started riding it in earnest, in case I found out that riding more than 1 mile caused me intense pain or discomfort, and it was probably too late to return it! The way this year was configured for me, it kinda feels like I didn't do much. In reality, I ran my first 100 mile trail race, and I did an Ironman. The former happened at the very beginning of the year, the latter at the very end, and between those things.. I really didn't do much. 20th Anniversary European Bike Adventure Part 3: The Bikes! Oops, my last bike adventure update was in August. After that, Ironman training took over my life, then the Ironman, then Thanksgiving and then Christmas. And now here we are! 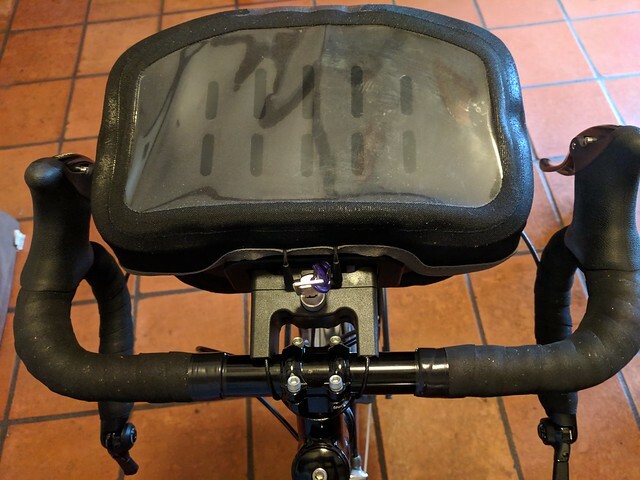 I sat down intending to finally write about our training, but looking at my last post, I now realize that I claimed I was going to next write about the bikes themselves. I guess I never did that. So I'll write about the bikes now, and the NEXT post will be about "training". Our choices were to rent bikes once we arrived, or to buy bikes here and travel there and back with them. Given the difficulty in finding a bike that fits me comfortably, and my intense desire to not be uncomfortable for 3 weeks on my bike, we decided to buy here and travel with our bikes. Plus that would mean we could train on the actual bikes we'd ride, and test out all our gear/bags for several months. Matt has done a LOT of research for this trip, and he found a few promising touring bikes that we could try out. 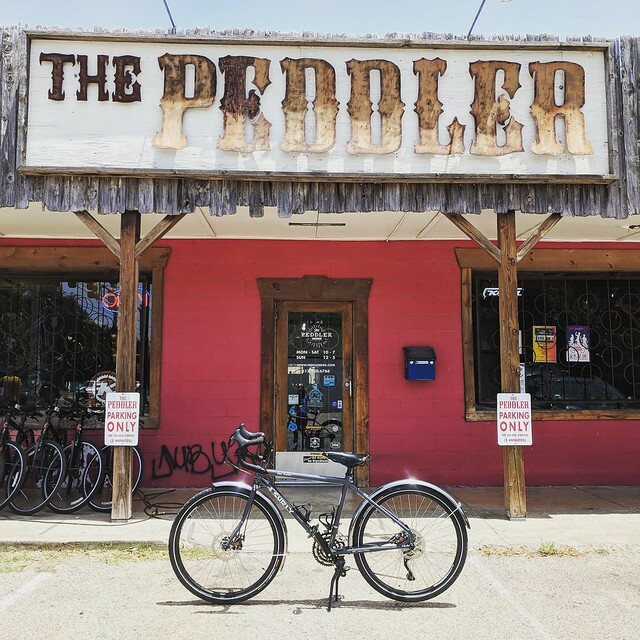 It turns out, The Peddler on Duval had both of those bikes, so we went there for the first time. Yay, new-to-us bike shop! Matt's turned out to be super easy. Not only did they have the bike he wanted, they had the size he needed, and his bike came pre-stocked with a good rear rack (and we added a front rack). Predictably, as with everything involving me and a bike, mine was not quite as smooth. We decided to try out a Surly Disc Trucker for me. Again, predictably, they didn't have one small enough for me, so they had to order it. Once it came in, we picked it up and we took it for a test spin. Aaaaand it was too big. I mean, I probably could have made it work, but I had to stand on my tiptoes to stand over it, and trying to swing my leg over something too high over and over every day for 3 weeks would just be asking for misery. And I'm aiming for something less miserable than misery. So fortunately The Peddler was willing to work with us to send that bike back and get an even smaller one. And that one fit! I mean, as well as anything not custom built for me is going to fit. 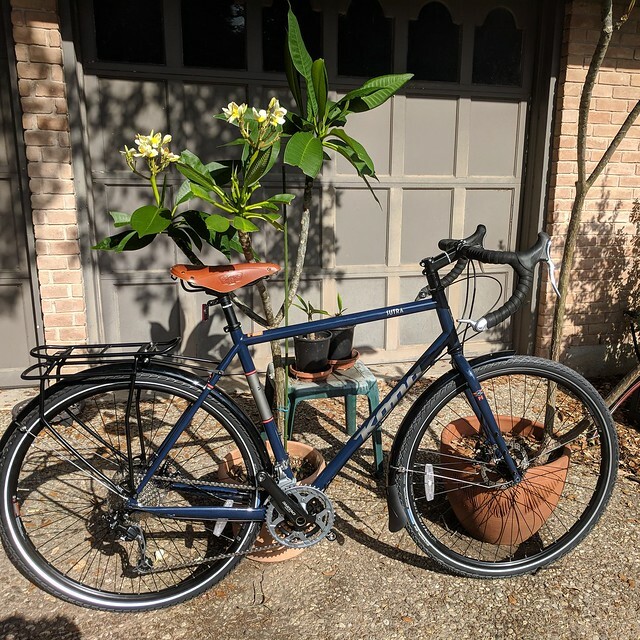 Unlike Matt's bike, mine did not come with any racks, so once I rode it to determine that it would work, size-wise, we took it back to The Peddler and dropped it off to have front and rear racks (Tubus racks) installed. This is important, since we need plenty of places to hang bags, since those bags will contain all the stuff we'll be taking with us. Even after I got my bike back again, with racks, I still didn't ride it. This was in the last weeks of Ironman training, and while I was doing plenty of riding, it was all on my tri bike. So instead of riding my new bike, we just spent more money on bike gear. First we decided which bags/panniers to buy. After reading reviews, we decided to get all Ortlieb bags. Good quality, waterproof, spacious, easy to affix, easy to remove, removable straps for carrying the bags off the bike. Matt decided to get red bags, I got black, so we can tell whose is whose. Over several months, we bought bags from REI every time they had a sale. This was a surprisingly expensive part of our gear collection, since we each needed two rear bags, two front bags, and then a handlebar bag. My handlebar bag. It might be my favorite piece of touring equipment so far. Then we had to get basic tools for these bikes. We each got properly sized tubes, a frame pump, a lock. Finally we had all the Stuff! Except, again, Ironman. So while I rode my tri bike, my touring bike sat and collected cobwebs, waiting for me to be done with Ironman so I could come play. And that will be my next post. Because my touring bike has shaken off the cobwebs and we've started getting to know each other! 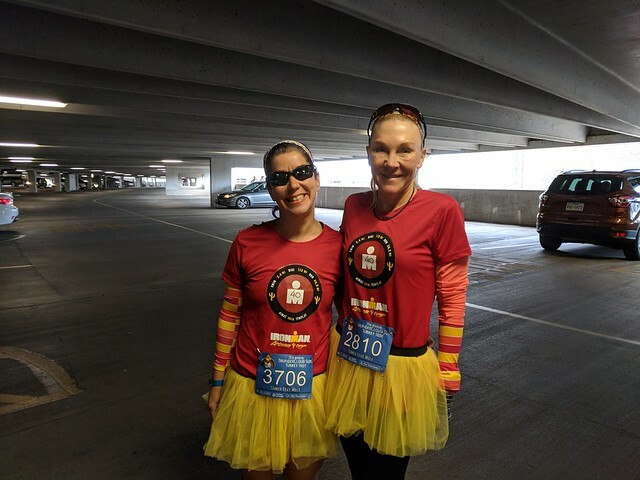 Turkey Trot 2018 race report. Twice in the past I have run the Turkey Trot 5 days after running a tough 50k trail run. This would be the first time I attempted to run the Turkey Trot 4 days after completing an Ironman. But this would be my FIFTEENTH contiguous Turkey Trot, so I couldn't not do it! And Karen would be in town to run it with me. AND so would Tristan and Ryan! So we all lined up together to earn our Thanksgiving meals. And it was fun. My legs felt better than I would have figured they would have. Certainly they felt better all week than they had the days leading up to Thanksgiving when I'd done the Wild Hare 50k. I'm glad that we were running with Ryan and Tristan. Karen would have pulled us MUCH faster, and I would have probably had to let her go, but Tristan and Ryan kept our pace more manageable, and I was able to chat and enjoy the run. We did end up doing a progressive pace run (not hard to do on that course, since the hills are all in the first 3 miles). By the last mile, Karen and I pulled ahead a bit, and Sharon ended up joining us for the last mile. She had ALSO just done an Ironman, so I dubbed us Team Ironman Idiots. I was breathing pretty hard for that last mile. After we crossed the bridge, Karen noticed we had lost Ryan and Tristan, and I said we had to wait so they could all cross together. So we pulled over in the finish chute and just sat there on the other side of the finish line waiting. I'm sure people thought we were strange. But once they caught up, we joined hands and all crossed together. It was a fun run, great weather, and a good last speed workout before Tristan's first half marathon next week in San Antonio! Also the slowest Turkey Trot I've run for a long time, but I'm so glad to have done it for fun, and not gotten caught up in trying to run it fast, to the detriment of my recovering body. 10:18, 9:59, 9:37, 9:17, 9:04 (and a 16:40 pace for the last 0.07, as we stood in the finish chute). Nice progression! I seem to be moving in the wrong direction, but maybe someday I'll race the Turkey Trot for time again, and bring my time back down! For now, I'm very happy with my decisions. 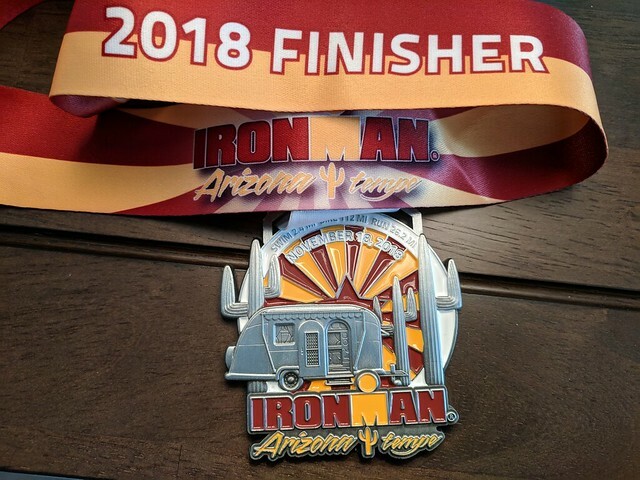 Ironman Arizona 2018 race report. Ironman #8! Hopefully the last one! Click here to read the race report. Ironman Waco 70.3 2018 race report. This race was our Half Ironman Before The Ironman race. A chance to get in a long supported workout and practice transitions. Try out anything new. Test things.